I've been brave enough to make the switch. You'll now find me over here. Please come for a visit! The weather teased us today, coaxing us outside without jackets (in January?) in order to enjoy a few moments of sun and warmth, and perhaps to remind us that spring is just 'round the corner? Of course the kids are still hoping for 1 good snowfall before winter ends. I usually hear a daily wish or hope or whine for some snow. Today I heard not a peep. But all was not fun and games. While my sons were out galavanting in the fresh air, my daughter was inside recuperating from her periodontal work she had done this afternoon. Poor girl. And I am posting about my finished scarf - the Bainbridge Scarf. It's a free pattern from Pepperknit. Go here to get it. I used KnitPicks Andean Silk, which has a very nice sheen and texture to it. The only trouble I had with it was actually trying to take a self-portrait without using a tripod, without showing the camera, and without revealing my...well...um...extra padding 'round the neck area. 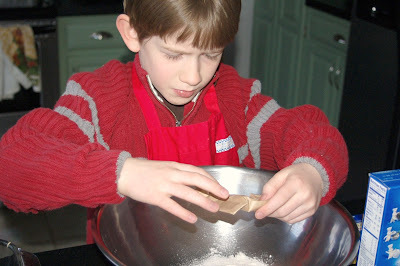 My youngest loves to help me in the kitchen, often asking to stir or whip or break eggs (his favorite). Usually I find that I'm in a hurry so my pat answer is, "Not right now... maybe later...but thanks for asking." The days come and go, come and go. This morning he asked again, seeing that I was readying to make a cinnamon coffee cake for breakfast. This time, I agreed. So he donned his apron and washed his hands, and as he began to stir and whip and break those eggs, he whistled some classical tune that one of his brothers had practiced just yesterday on the piano. I couldn't help but thinking what joy he showed in doing such a simple job. Maybe all of us should whistle more while we work? My daughter will be handing out magnifying glasses soon... in order for us 40 and abovers to actually see her artwork. She loves creative endeavors and usually chooses something tiny to sculpt or cut or paste or draw. I can understand her attraction to tiny things - they're transportable, they're cute, their size is attractive - like holding a tiny treasure in the palm of your hand. When she has the time (there isn't much to spare with her school schedule recently), she likes working with sculpey or paper or yarns, mostly. the crane is her smallest one to date - wingspan is 1"
Right now, she's taking a career exploration class at our co-op, and it wouldn't surprise me if she went into an art field. Let's just hope it's not a starving artist field! P.S. - some more fun origami can be found here and here and here. Nothing brightens your day than a visit from a friend and a time to discover, to catch up, to renew, to deepen a friendship. Thanks, Kristen... we should do that again soon! Another ray of sunshine in the form of garden-fresh tomatoes (from our summer supply & frozen for use during the dead of winter) that will be our dinner tonight. Can't wait. 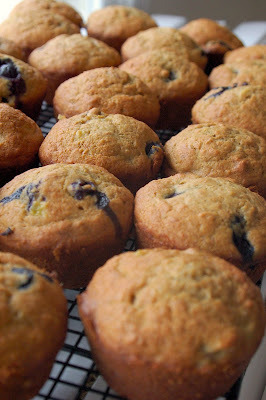 We awoke to a dusting of snow this morning which once again, led me to more baking. My friend, Susan, whom we visited during our Christmas break, is a wonderful baker. She treated us to these three yummy recipes. And you know how recipes go... passed down from one person to the next. One of these apparently came from a second friend, Karen; the last came from a third friend, Sarah (another fantastic cook!). Thank you ladies for contributing to this blog! And now... I now pass them onto you. They are very good. Enjoy! Preheat oven to 350 F. Combine all. Grease a 9 x 12" pan. Bake 30 min. Preheat oven to 350 F. Cream butter & sugar. Add egg & beat. Add molasses & vinegar. In another bowl, combine dry stuff. Add dry stuff to butter mixture. Mix well. Roll into 1" balls. Roll balls in sugar. Put on baking sheet, flatten with bottom of glass. Bake 8-12 min. Preheat oven to 350 F. Grease muffin tins. Beat eggs then combine with butter, pumpkin & sugar. In another bowl, mix dry stuff (except chocolate chips). 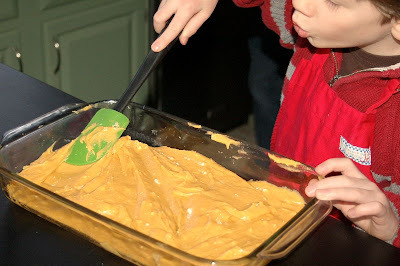 Add dry stuff to pumpkin mixture. Stir in chips. Fill muffin tins (if too much - just put 'extra' dough into another baking dish) and bake about 20 min or until toothpick in center comes out clean. Hmmm... stripes and plaids do not really fit the 'color' category, but Curious Bird said any color combo of stripes or plaids is fine. Now I have to say, plaids are not something I usually go for. Stripes on the other hand... at one point I was crazy for stripes when it came to dressing my kids. We became known as the 'striped family' by many a friend's children. When my oldest reached 13, he specifically asked me NOT to buy him any more striped shirts. That was okay - I still had 3 younger ones to dress in stripes. Here is a very fun thing to do if you're trying to create your own stripes. Thanks, Leya, for a nice color week. Ah... pink! I'd like to say either I love it or hate it, but there are so so so many different shades of pink that's it hard to be definitive in my decision. As I look around my house though, I really don't see pink unless rosy-cheeked children count! We haven't tasted this one yet, and unfortunately, I realized mid-stream that I didn't have any puff pastry in the freezer as I had thought; it turned out to be filo dough. So, this was a dark beer & beef SANS pastry. I'm sure it'll taste wonderful - all the ingredients were lovely, and the onion-y fragrance filled (overwhelmed) my kitchen. Although next up will be whole wheat pizza dough (also from Martha's magazine), I realize that too much whirling can make anyone dizzy, so most likely a lull on the cooking front will occur next week. Unless of course we get snowed-in! Yellow is not a favorite of mine, but I do find bits and pieces of it around our house. My husband likes various hues and tints of yellow more than I.
overripe bananas destined for muffins? But the color is growing on me. I usually prefer a pale yellow like butter or a dark one like ground mustard. It is a sunny color, full of brightness and light, so that's a plus. a quick glimpse outside ~ hoping for more snow! For more yellows, go visit Curious Bird! earrings that I seem to be wearing daily - too lazy to reach for another pair? As a child, I went through a purple phase: purple bike, purple room, purple polyester pants (which I loved, by the way), purple print peasant top. Then I strayed away from the color, allowing blue & green to take its place, along with black, my all-time favorite. I still like purple... but in smaller, quieter, more subtle doses. Too see more purples... visit here. I thought I'd post some appropriate shots. Our weekend sped by. Gone too quickly. I didn't get to organization (unless laundry counts) or to making a list of knitting projects, but we did have a nice dinner with friends on Sunday. Very relaxing. So all in all... a good ending and beginning. Molly is giving away an Epson printer. Go here to enter her lovely giveaway! Gotta go! We're having friends in tonight - tacos and brownies and bananas foster - yum. The last few evenings, my husband and I have been catching up on Lost by watching the Season 4 dvd (a Christmas gift from my dad... Thanks, Dad.) It's amazing how much I've forgotten since the season ended in May!!! Will we watch the new season? Well... probably. Part of me wants to picket, to protest to the insane scheduling of ABC and yet, the other part of me (the weaker part?) wants to tune in just 'to see'. As is often the case when I watch something, I like to multi-task. Eventually this will be a blanket. I began working on it several years ago (um, like 4 or 5 years?). Yes, I like to keep different projects going at the same time - keeps things interesting. Why I chose to knit a blanket rather than sew one, I don't know. Temporary insanity? I know I could frog it, but lots of time has been invested in it already. Oh well. I started with a seed stitch on size 10 needles but soon switched to a garter stitch to save time. I've just been knitting it in strips, starting with one skein, knitting until that skein ends and attaching the next skein. It's made from Lion Brand Homespun, an inexpensive acrylic with an interesting texture and sheen. I didn't want to spend a bundle on something that would most likely get dumped on the floor, dragged through lint and dust (a certainty in my house), sat upon, spilled upon, etc. I mean, a blanket is to be used right? Not just a showpiece. ...what gets into the heads of individuals. Yes, I'm slow (very slow & late) in learning about an issue that started out with good intentions but has ended up with very real & possible dire consequences for many artisans... CPSIA. You can go here to read more. I've checked this out - it is unfortunately in the works. Hopefully amendments will be made that can help small businesses and craftspeople keep their livelihoods. Sigh. A new scarf is emerging. Made from Knitpicks Andean silk. Today, we began homeschooling again. Almost full swing. I had good intentions to keep the kids 'doing' school while away on vacation these past few weeks, but in actuality, the schoolbooks just took up valuable car space (we had to ship boxes home in order to fit all of us in the car). Note to self: don't even entertain the notion of schoolwork while on vacation! The color is really a bit more red than rose as shown in the photo. Aside from the initial grumbling and 1 minor episode needing a new attitude (cue Patti LaBelle), the day went well. Better than expected, really. A new year always offers a fresh start and (hopefully) a close to some of the bad habits that we all fall into during the course of the year. Making new years resolutions however, was a 'dirty' word in my vocabulary. The anti-establishment part of me wanted to rebel against the idea while the need to be organized part of me wanted to embrace it. The truth of the matter? Fear of failure. I mean, who really likes to admit that even before February begins, that half of your resolutions haven't even got off the ground. Pas moi. So, for years, I wouldn't make any 'official' resolutions. That way...I wouldn't be setting myself up to fail. This year, however...I thought I'd make some resolutions not just for 2009, but hopefully life resolutions. Taking some complex notions and making them more simple. My list? Nothing really new or life-altering, nothing to change drastically... just a simpler approach to things. Quiet things. Probably ho-hum, ordinary, 'boring' ideas and very broad categories...but if put into action... who knows? Life shattering? I wanted to write some basic categories down as a reminder to myself, knowing full well that each category has many sub-categories, sub-stratas to it, and I will therefore need to make a list for each one. But for now, this will suffice. As promised...My mom wanted handmade soaps for a Christmas present this (past) year, so after purchasing some wonderful scented goat's milk soaps from here and here, I knitted a few washcloths to go along with them. I used Sugar 'n Cream cotton yarn in 3 different colorways. It was such a quick thing to knit up that I need (would like) to make some more for my own use. The pattern's free... you can get it here. Homespun Living also has a free pattern for a knitted coffee mug cozy too. Hmmm... lots of warm drinks on the horizon?